The unshelled pecans, dumped out of my bucket, scattered across the snow-covered compost pile. Also known as the “stuff critters gobble up before it has a chance to decompose” pile. Stale or not, pecans in January would probably be a treat for the mice and voles lucky enough to discover them during the night. For someone whose mind is warped just slightly in the right direction, it would be easy to imagine the conversations they might have. At this point, someone with too much imagination might be feeling a little bit embarrassed. If that someone knew the complete story of the treasure nuts. There’s no reason for embarrassment, really. It’s only been mumble-mumble years (Technically—not that anyone is counting—it might be a double-digit number greater than the ages of half my grandkids but less than the ages of their parents.) since said person bought her new pair of cross-country ski boots. This was just before we had several dry winters in a row with hardly enough snow for cross-country skiing. By the time there was snow again, cross-country skiing had lost its appeal. 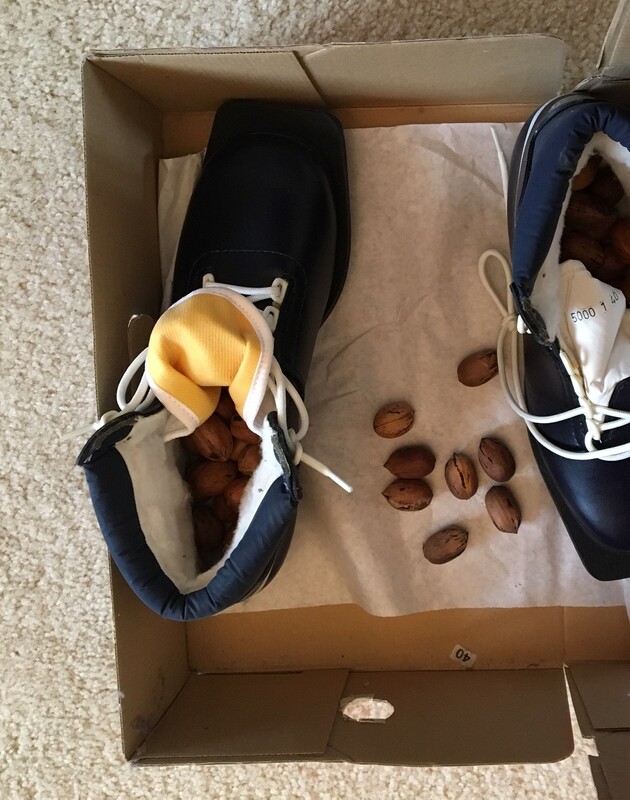 Since then the brand-new boots have sat forgotten in a corner of the closet, in their brand-new box, unopened—at least by human hands. But eventually, even someone who doesn’t pay much attention to the finer details of housekeeping has to clean out her closet. She might decide those unworn ski boots need to go. And inside the box, she just might find ever-so-many-times-great grandma mouse’s long-ago stash. Then, after she got over being embarrassed and dumped out the pecans for ever-so-many-times-great grandma’s descendants, she might start to feel guilty. Because she might remember the end of the legend. It’s hard to sleep when the neighbors’ drama is happening outside your bedroom window at 2:45 a.m. The noise that woke me wasn’t all that loud, but it was clearly the sound of someone in distress. When it was repeated, I put on my glasses and peeked through the window, trying to be quiet enough for my spying to go undetected. The sounds were coming from the left, outside of my field of vision. But in the light of a moon that was either half full or half empty, I made out a vague shape just below the window. When it moved, I could see that it was a fox, also focused on the sounds. It started toward the noise, came back, watched a bit more until the sounds stopped, and then ran silently off toward the right with its tail flowing behind it. After a few more uneventful minutes, I settled back into bed. Apparently whatever had happened out there in the dark was some variation on the circle of life. Or, more precisely, the circle of life and death. Somebody, on a night of good fortune, got to have breakfast. Somebody else, less fortunate, got to be breakfast. Apparently the fox, like me, was only an observer. This assumption was confirmed when I went for a walk later in the morning. Starting at the corner of our property, following along and then across the road, was a trail of blood drops. After this little life-and-death drama had played out, it took me a long time to get back to sleep. When I did, I dreamed that a troop (herd? mob? barrel?) of monkeys broke into the house and ate all my bananas. At 6:00 a.m., I woke up to another mysterious noise, which turned out to be my stomach growling. Thankfully, it was a day when I was one of the fortunate ones who got to have breakfast. I didn’t even have to hunt for or kill it first. And the only unfortunates whose lot it was to be breakfast (besides the banana—thank goodness, the monkeys were only a dream), were the hapless goobers that had been ground into my peanut butter. I hope the fox was equally fortunate. A few days before Halloween, eeriness is in the air. Even on NPR. Driving across the state last week, I heard some very scary things. The most frightening was a “Science Friday” interview with two arachnologists who were terrifyingly enthusiastic about spiders. I had never before heard anyone use “spider” and “adorable” in the same sentence. They were especially excited about the peacock spider, named for the bright colors and pattern on its body, which according to them is not only adorable but is also gorgeous. Given the season, the interview focused on scarier critters, the black widow and the brown recluse. The scientists were quick to explain that, even though their bites can be dangerous, these spiders are still adorable because they don’t really want to bite you. The reason? Energy conservation. It takes a lot of body energy to create venom, which of course is intended to paralyze prey so the spiders can eat. Efficient little critters that they are, they’d rather save the precious stuff for their next meal than waste it repelling enormous and inedible humans. They will only bite if they believe their lives to be in acute danger. If you see a brown recluse spider, it probably isn’t. They weren’t named “recluses” because they run around in public. They prefer their privacy and will be happy to leave you alone if you leave them alone. Their brown violin-shaped body markings are also shared by many other harmless spiders, like the wolf spider. You can easily tell the difference, because wolf spiders have spiky little thorns on their legs and brown recluses have fine little hairs. Also, wolf spiders have eight eyes and brown recluses have six eyes, arranged by twos in a tidy symmetrical pattern. So if you see what you think is a brown recluse spider, there’s no need to panic. All you have to do is sneak up on it until you’re close enough to count its eyes and see the tiny hairs on its legs. About, oh, an inch away from the end of your nose ought to be close enough. Just be careful not to appear threatening, so it won’t bite you. Actually, all of this information about the harmlessness and general adorability of spiders was quite useful the morning after I heard it. I was about to step into the motel shower when I realized I was sharing the bath mat with a fuzzy brown spider the size of a Shetland pony. Okay, okay, that’s an exaggeration—it was only the size of a Chihuahua. Just with longer legs. Well, maybe not quite that big. But big enough that, even without my glasses, I could clearly recognize it as a spider. Big enough that I really didn’t want to share my bathroom with it. And definitely big enough that I wasn’t going to stomp on it with my bare foot or whack it with my hairbrush. Besides being a reasonably live-and-let-live kind of person, I didn’t want to deal with the yuck factor of spider innards all over the bath mat. So arachnicide was not the answer. Instead, I flapped a hand towel at it, herding it out of the bathroom. It disappeared around the corner. Out of sight, out of mind: problem solved. I enjoyed my shower in privacy. But when I came out of the bathroom, the spider was just a few feet away from the door. Not moving. It was staying camouflaged against the brown carpet while it caught its breath, I decided. I detoured around it as I went across the room to get dressed. I detoured around it again when I went back to the bathroom to dry my hair. I detoured around it again when I went over to the desk to check my email. I went to breakfast. I came back half an hour later. The spider was still in the same spot, looking smaller somehow and not at all threatening. Because it was dead. I swear, I never touched it. I never even got close enough to count its eyes. The arachnologists forgot to mention one thing. Apparently, it’s possible to frighten a spider to death. Having houseguests can be a bit stressful. Even when they are quiet, unobtrusive sorts who don’t make a fuss, scatter their stuff all over the house, or criticize your cooking or housekeeping. Still, there’s always the issue of trying to be a gracious hostess without hovering. There’s a delicate balance to allowing guests to follow their own schedules and preferences while trying not to unreasonably disrupt your own. Then there’s the issue of staying out of each other’s way in the kitchen. Courteously allowing guests to share counter space instead of swiping at them with the dishcloth. Not stepping on them while you’re cooking. Not scalding them with the teakettle. Letting them share the sink without washing them down the drain. Oh. Sorry. I forgot to mention that the particular guests I’m talking about are ladybugs. Otherwise known as ladybird beetles. Coccinellidae, if one wants to be formal. The name comes from the Latin word for “scarlet,” which certainly fits these little red beetles with their dainty black spots. Apparently the “lady” originated in Britain and was associated with Mary the mother of Jesus, who was often shown in early paintings with a red cloak. I didn’t find any sources that speculated on whether Mother Mary would have been honored or annoyed by having insects named after her. At least these are beneficial insects, for the most part, being primarily aphid-eaters. They seem friendly, too, though that may be due merely to the cheerful little spots. Anyway, this time of year we are subject to random visits by ladybugs, mostly in our kitchen. I don’t know where they come from. Mostly they crawl around on the back of the counter near the window, with occasional forays up to the top of the screen. I never deliberately squash them. Protecting them from accidents, however, is sometimes difficult. Fortunately, ladybugs seem to be tough little critters. They recover quite well from being flipped upside down, are not easily discouraged by inadvertent finger-poking, and do not drown easily even in hot water. There was the one I tried to wipe up with the dishcloth, thinking it was an apple seed or a cracker crumb until I saw its legs. By then it was tangled in the fabric, so I spread the dishcloth out on the counter so it could extricate itself (which it eventually did) and got another cloth to finish wiping off the counters. Every now and then one is hiding in the sink when I start to fill it with hot soapy water, and when it floats to the top with its legs flailing I fish it out with a spoon and dump it out on the counter. After a bit of gasping and wing-flapping it pulls itself together and crawls away, sadder and—I hope—a bit wiser. Once in a while, of course, a ladybug does get squished or drowned. But it’s always accidental—I swear. Yesterday, though, I thought the ladybug perils had reached a new level. I was vigorously stirring batter for a batch of oatmeal bread, and there was a round red-brown spot. Uh-oh. I fished it out with my cooking fork and took a closer look. Luckily, it was only an undissolved lump of brown sugar. I think. I’ve never been in the habit of sleeping with members of species other than my own. True, there have been a few exceptions: the one-night experience with the snoring cat from Boise, whose name I never did catch, and the slightly longer but still clearly temporary relationship with Lucy the watchful chocolate Lab. Otherwise, the various critters who have shared my household over the years were roommate acquaintances rather than intimate bed-sharers. The six or seven cats who came and went did most of their sleeping during daylight, lolling around the house all day and then going out at night in search of adventure elsewhere. Various other critters lived in cages in the rooms of various children, with occasional lapses. The guinea pig (Or were there two? I don’t remember—they all look alike, you know) escaped to precarious freedom inside the bathroom wall. The salamander sought sanctuary beneath a stack of towels in the linen closet, where I found its mummified corpse a few years later when we moved. The four uncomfortably large rats eventually drove their owner out of his own room with their gnawing and their odor, and in consequence they were banished to the garden shed. But this past weekend, I found myself in a situation that got out of hand. As so often happens, it started out innocently enough. I spent a day and one night with one family of grandkids while their parents were off on a much-deserved short vacation. Once settled in, these marvelous children sleep soundly like little angels until morning. This, theoretically, means a spending-the-night grandma who is a light sleeper can do the same. But there is the little matter of the two dogs. During the day—in between naps—one of them patrols the back yard and chases invading birds and squirrels. The other prefers to hang out indoors, but—in between naps—she has a frequent need to go outside and come back in. Opening the door for her easily adds up to a couple of hundred steps for her human minions; if she isn’t getting a commission from the FitBit people, she should be. Given these busy schedules, it’s not surprising that the dogs go to bed as willingly as the children. This would be great for a spending-the-night grandma, except that the dogs sleep in the master bedroom. True, they have their own beds on the floor. And on this particular night, they were very well-behaved. They didn’t squabble; they didn’t bark; they didn’t jump onto the bed; they didn’t once ask to be let out. But they did snore. In different keys. They also snuffled and snorted and coughed. Every now and then one of them—dreaming, maybe—scrabbled against the foot of the bed with its toenails. Several times one or the other either had to scratch a mighty itch or had to get up to stretch and shake itself all over. In either case, the process involved a great deal of collar rattling, loud flapping of ears and jowls, and deep sighing. One of them also sneezed periodically. The first time, half-asleep as I was, I automatically said, “Gesundheit!” Then I realized how silly that was—duh; I know perfectly well the dogs don’t speak German. It was a long night. By morning, I was thoroughly convinced of the wisdom of my lifetime choice to limit my sleeping partners to the human variety. At least if they snore, one can poke them lovingly in the ribs and gently suggest that they roll over. This does not mean I’m prejudiced or xenophobic. I am not a bigot. I am not a speciesist. I have a great deal of tolerance, even affection, for many members of species other than my own. It doesn’t even bother me if my children sleep with them. Just as long as I don’t have to. Everything I know about tracking I learned from Rolf In The Woods, by Ernest Thompson Seton, who as well as being a naturalist and writer was one of the founders of the Boy Scouts of America. The book was among the contents of the single bookcase that made up the library in our small country schoolhouse, and I read it several times. Still, my ability to decipher the secrets of wild animals by the tracks they leave behind is limited at best. Even so, going for walks along the gravel road that leads to my parents’ house, I sometimes notice clues about who has been out and about. Especially, like the other morning, when it has just rained. That day, I could see that several deer had been out even earlier than I was. Maybe, unlike some people, they hadn’t taken time for a cup of coffee first. Two or three of them had meandered in and out of the ditch, crossing and recrossing the road. A doe and fawn had taken the same route I was walking, leaving parallel sets of tracks for a quarter of a mile. The doe’s dainty hoof prints made a straight line along the edge of the road. The fawn’s delicate little toe marks showed it had walked on one side of mom for a while, then on the other, and sometimes it had wandered off to the middle of the road. I could easily imagine her flicking her ears and looking back to remind it to stay close. I was pretty sure they were whitetails. Not from the tracks, though Ernest probably would have been able to tell, but from the fact that I had seen a whitetail doe along the same stretch of road the day before. Checking out the machine shed near the house, I could see clear tracks in the soft dirt of the floor. I recognized them immediately as porcupine tracks that were about 24 hours old. You can attribute this to my superior tracking skills if you like. In fact, I really wish you would. It’s possible, though, that my conclusion may have been based on the coincidental fact that the previous morning, as we sat at the breakfast table, we had seen the actual porcupine. My mother first spotted it as it went into the machine shed, silhouetted against the morning sun that turned its long fur and quills into a spiky halo. Apparently it didn’t find whatever or whomever it was looking for in the building, as it came out a minute or so later. Supposedly these animals move slowly, but this one headed across the yard at a brisk pace like a porcupine with a purpose. It waddle-marched across the driveway and past the porch, paying no attention to the mere humans when we went to the door to look at it. It made its way around to the back yard and disappeared into the windbreak trees behind the house. We never saw it again, but at least now I know what porcupine tracks look like. On my way back to the house, moving with purpose myself because it was time for breakfast, I came across some odd marks in the gravel. They almost looked like ripples. One of the things Ernest neglected to mention is that gravel, even wet gravel, doesn’t take tracks very well, so I couldn’t be sure. I wondered briefly whether they might mark a place where a hawk had swooped low after a cottontail or mouse. Then I saw more of the odd marks and realized they seemed to follow the road. Looking more closely, I figured out what they were. They marked the passage of a bipedal brown-eyed perambulator. I was looking at my own tracks. Ernest would not have been proud. There’s nothing to bring you fully awake early on a winter morning like going outside to experience nature while you walk up the driveway to get the newspaper. The brilliance of the stars in the still-dark sky to the west contrasts with the brightening of dawn in the east. The crispness of snow under your slippered feet and the freshness of the frigid air are invigorating. What really brings you to full alertness, though, is the tingling sensation on the back of your neck that suggests a mountain lion might be watching. I’ve written about this before, but in the past couple of years I haven’t worried too much about mountain lions. This is probably due to several factors: the city’s effort to thin the urban deer population, a lion hunting season that has reduced the number of big cats in the Black Hills, the idea that familiarity breeds contempt (or at least nonchalance), and the fact that our newspaper subscription now includes full access to the online version. Then, a few weeks ago, my partner learned something disturbing while he and our next-door neighbor were enjoying some male bonding over a problem with our shared water well. The neighbor said that twice in the past couple of years, he had found the half-eaten carcasses of deer—clearly killed by mountain lions—in the shallow gully between our houses. The gully right next to our woodpile. The gully where I pick chokecherries. The gully where the neighbors’ kids had a clubhouse when they were younger. The gully that parallels the driveway we walk every morning when we get the newspaper. I’m so glad I haven’t wasted any energy worrying about mountain lions. Not that I’m really worried even now. Honest. I have protective strategies. First, I always put up the hood of my winter coat. I know it wouldn’t really protect the back of my neck from a lion’s teeth, but it might affect his aim. Second, when I get the paper out of the box, I always roll it up into a tight cylinder. As a defensive weapon, it’s pretty flimsy, especially on Mondays and Tuesdays when there are hardly any advertising flyers. But still, surely no cat would appreciate the humiliation of being whacked across the nose with a newspaper. But the most important strategy is to always take my shower first thing in the morning. That way, when I go up to get the paper, I smell like soap, shampoo, and body lotion. My idea is that any lion who catches a whiff will not associate my scent with food. The reaction I’m hoping for is, “Eeew—what’s that awful smell? Can you imagine getting a mouthful of that stuff? Yuck!” Ideally, any discerning predator will sneeze, gag, and take its sensitive nose and sharp teeth somewhere else. He’s talking about fiction in a larger sense. In the February 2015 Smithsonian magazine, Harari gives an example of one universal fiction: money. Even though money doesn’t have any inherent value, we have created and we believe in a whole system of exchange based on it. When it comes down to creating fiction at an individual level, however, I’m not sure humans are as unique as we might like to think. As evidence, here’s a true story about a man and a dog. I promise, I am not making this up. I wasn’t there when it happened, but it was told to me by one of the participants, who—despite his behavior on this occasion—is generally ethical and trustworthy. One summer day the man and the dog were at a lake, playing a game. The man would throw a stick out into the water, the dog would swim out and retrieve it, the dog would bring it back to the man, and the man would throw it again. The man got tired of the game before the dog did. When the dog brought the stick back for the eleventeenth time, the man pretended to throw but didn’t let go of the stick. He created a fiction. The dog, still full of energy and eager to play, didn’t notice the fake. He dashed out into the water to retrieve the stick, which, of course, he couldn’t find. He swam back and forth several times, searching. Eventually he swam back to shore, empty-mouthed. But instead of coming directly back to the man, he searched along the bank until he found another stick. He picked it up, started toward the man, then stopped. He trotted back to the edge of the lake and dropped the stick into the water. Once it was wet, he grabbed it again and brought it back to the man. The fiction he created was actually more elaborate than the fiction the man created. Without words, both the man and the dog lied to each other. You can decide for yourself which one was the better storyteller. The larger question of the ethics of inter-species lying is perhaps a topic for another day. But, keeping in mind that the man told the first lie, I just might mention another observation on the uniqueness of humankind. There I was, minding my own business, taking an innocent walk down the lane that leads to my parents’ farmhouse. Suddenly this gigantic critter erupted from the grass practically under my feet. While I stood there gasping, waiting for my heart rate to subside, it dashed off to what it apparently considered a safe distance. There it stopped and stood up on its hind legs to reconnoiter, its eyes wide, nose twitching, and ears swiveling. Come to think of it, I haven’t seen many jack rabbits in recent years, either. Maybe they’re all that big, and I just didn’t remember because it’s been so long. The rabbit population seems to follow cycles of abundance, over-abundance, disease and die-off, scarcity, and resurgence. Since I haven’t lived on the prairie for a long time, I’ve probably missed a few cycles. This week, however, I discovered what may be another reason why jack rabbits seem a little scarce. They’re being abducted and genetically modified into a different species. If you don’t believe me, check out this January 19 article in the Rapid City Journal. It features “the world’s foremost jackalope maker,” who provides thousands of these exotic critters to Cabela’s. The rabbit I saw in my parents’ lane would no doubt make an impressive jackalope. I hope, instead, it enjoys a long and prosperous life as a jack rabbit. And I promise to watch out for it the next time I visit. I wouldn’t want it to suffer the same fate as the last South Dakota jackrabbit I got close to. That time, we ran over it. On Good Friday. I swear, it was an accident. We were driving after dark on a gravel road when the rabbit, no doubt stressed out and distracted by its seasonal duties, dashed out in front of the car. It’s a terrible feeling to realize you have just squashed the Easter Bunny. Maybe it would have been better off as a jackalope. To Swat or Not to Swat? Supposedly, in some cultures, there is a belief that if you save someone’s life you then become responsible for that person. I did extensive research (five whole minutes with Google) and didn’t find any evidence that this is actually true. Which makes sense, since the whole idea seems backwards. Wouldn’t it make more sense to have it the other way around? The savee, after all, is the one owing a debt to the saver. Not to mention that potential rescuers might be discouraged from saving anyone’s life in the first place, given the potential long-term consequences. But my real question at the moment is whether this tradition, if it even exists, applies to non-human species. Insects, specifically. Every fall, when the weather gets cold, we have a mild invasion of wasps. They either migrate inside to keep from freezing to death, or they emerge—and this is not a happy thought—from wherever they have been living inside the walls. A few weeks ago, when temperatures were falling below zero, one of these wasps took up residence in the kitchen sink. Not the smartest place to settle. For one thing, the stainless steel got so cold overnight that the wasp was too numb to move by morning. Besides, a sink is a place where water can gush forth at random intervals and unpredictable temperatures. Innocent insects are at constant risk of being plunged into a maelstrom that will take them down the drain to a watery death. I rescued this particular wasp at least twice, plucking it out of the sink before I committed the potentially lethal act of washing dishes. After that, while it tended to stay out of the sink, it still made a nuisance of itself by crawling around on the counter or perching on the faucet. The fact that it didn’t ever sting me in a moment of ungratefulness was due solely to my being careful not to accidentally put my hand on it. The critter was annoying. I really didn’t want it around. Still, since I had saved its life, I couldn’t bring myself to swat it or toss it outside to perish in the cold. It would have been too much like healing a convicted murderer’s life-threatening illness in order to have him healthy enough to walk to the electric chair. I just couldn’t handle the irony. So I put up with its presence for several days, moving dishes around it and checking to make sure it wasn’t lurking in the sink before I turned on the water. Then Monday came. And with it, the wonderful woman who cleans our house every other week. She hates wasps. Unlike me, she had no relationship with this one. When I came back, the house was clean. The kitchen counter was polished. The sink was gleaming. And the wasp, by strange coincidence, was nowhere to be seen.